Montreal's Olympic Stadium Welcomes Haitians, Other Asylum Seekers From U.S. The Olympic Games left Montreal more than four decades ago. Major League Baseball's Expos skipped town in 2004 for Washington D.C., where they now play as the Nationals. 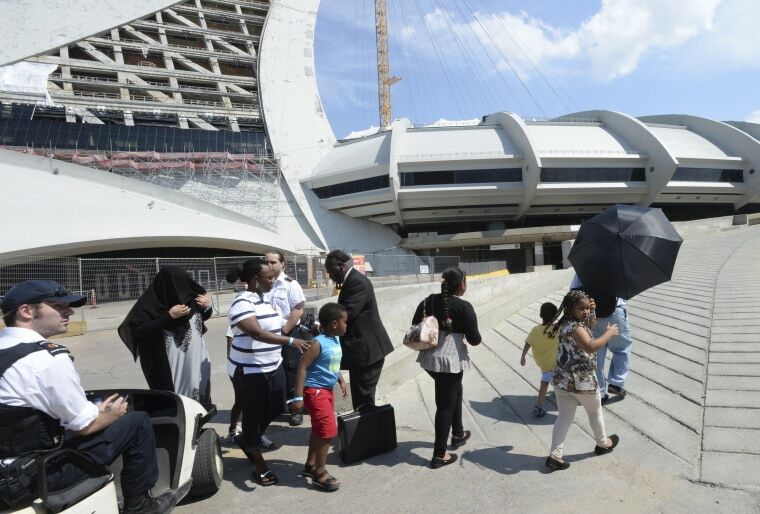 So the operators of Montreal's Olympic Stadium had plenty of room this week to open their doors to a group of foreign asylum seekers, including many from Haiti, who are seeking refuge in Canada. The refugees began arriving Tuesday at the same stadium that gained international attention in 1976, during the Summer Games that featured American Edwin Moses running for a gold medal and world record in the 400 meter hurdles. By Thursday, about 100 of the newcomers were bedding down in cots, beside a concession area in the stadium, which can hold up to 66,000 people, officials said. They were showering in facilities once used by the Expos and their opponents. And they were being fed from concessionaires, called into service for the new arrivals. The government of the Province of Quebec said the housing would be temporary, but also signaled that the small encampment could grow. They asked the stadium operators whether they could make room for as many as 600 cots. Though the newcomers are from many countries, some told journalists they were Haitian and felt less welcome in America after President Donald Trump said in May that protective status for those who fled a massive 2010 earthquake could be withdrawn, according to the Canadian Broadcasting Company. "They called us on Friday to see if we had any space available, so we went to our team and looked at the situation," said Cédric Essiminy, a spokesman for the Olympic Stadium. "We came back and said, 'Yes, we have room for you.' So in less than 24 hours we were able to make a shelter, with everything needed to greet the refugees." While Trump has tried to impose limits on immigration and ordered a virtual ban on visitors from six majority-Muslim nations, Canada and its prime minister, Justin Trudeau, have welcomed refugees, particularly from civil war-torn Syria. Montreal and surrounding communities in the province of Quebec are home to multiple shelters for the new wave of immigrants. Most previously went to a Montreal YMCA that was formerly a hospital. When that facility became over-crowded, a few hotel rooms and university dorm rooms opened their doors for immigrants. The Olympic Stadium is the newest alternative. The province estimates that 1,174 asylum seekers have crossed into Quebec in July, a huge increase from the 180 who entered in the same month a year ago, a provincial official told the CBC. The path to opening the stadium shelter was undoubtedly smoothed by the fact that the facility is owned by a unit of the government of Quebec. While there are some events on the stadium grounds this summer, there are no major bookings for the domed-stadium itself until October, when a large gymnastics competition comes to town. The Montreal Alouettes of the Canadian Football League are currently practicing at the Olympic Stadium, but they play their home games in another stadium, so they do not present a conflict with the refugee housing, said the spokesman, Essiminy. While many of the newcomers are from Haiti, others are Palestinian, Somalian and from other countries. Most came to Canada by crossing the international border away from major roads and official ports of entry, because a pact between the U.S. and Canada would require that they be turned back to the U.S., if they arrived via those official border crossings. The Safe Third Country agreement says that both the U.S. and Canada are considered safe harbors and refugee applicants who arrive in one nation first are supposed to be denied admission to the other, if they try to move on. But that rule is waived for those who dodge formal border checkpoints and find another way into Canada, according to Paul Clarke, executive director of Action Réfugiés Montreal, a non-profit that serves immigrants. Clarke said the influx of Haitians and others has increased as Trump has continued to send less-than-welcoming signals to immigrants. "It's like you have escaped one fire in your home country and now you have arrived somewhere else, in the U.S., where you might not quite feel safe," said Clarke. "So you move on to what seems to be the next safe haven, Canada. That is the metaphor for what we are hearing from some of these people." The immigrants ultimate fate is yet to be decided. To must have their refugee status affirmed to remain in Canada for the long term and that means proving they were subjected to racial, religious or political discrimination in their homelands. In the meantime, a citizens have been reaching out to his agency, Clarke said. The Canadians are asking what they can do to help smooth the path for the immigrants.